Talk to your Mobility Specialist today about the extended vehicle protection options offered through our partner, CostGuard. After all, you are investing your time and money into your new wheelchair accessible vehicle; let that also give you peace of mind throughout the life span of your vehicle. Buying an automobile is often the second largest expense for individuals and families – protect yourself against rising repair costs of mechanical failures. The CostGuard Vehicle Protection Plan offers optional coverage for Mobility Equipment including chair lift motors and assemblies, electric/hydraulic ramp controls and assemblies, adjustable seating mechanisms, adjustable pedal and steering control mechanisms, hoist and swing-arm mechanisms. 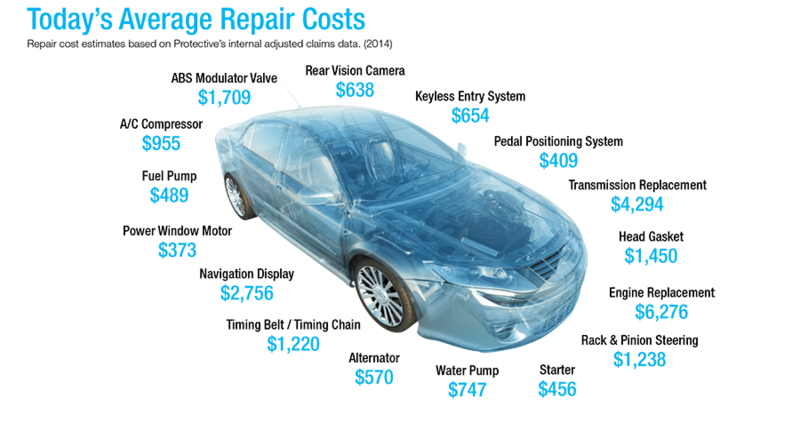 Listed are a few example average repair costs that you could end up paying out of pocket for your wheelchair accessible vehicle. Powertrain Coverage covers Engine, Transmission, Front and Rear-Wheel Drive Train, Hybrid Components and Associated Fluids, Filters, Lubricants, Seals and Gaskets. Complete Coverage covers any part experiencing a mechanical breakdown except for those parts listed as excluded under the service contract.